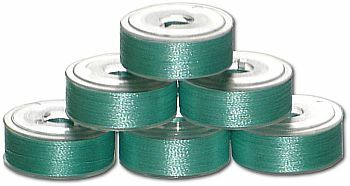 Each bobbin includes 125 yards of premium quality long-fiber polyester thread. The color has an exact match in ThreaDelight ™ top poly thread palette! We digitize and test stitch embroidery designs - a lot of them. Afterdoing a simple calculation, we realized that it is cheaper to use prewound bobbins (not mentioning the saved time & frustration). The bobbins include 60 wt thread, are L size, plastic sided. Most embroidery machines use exactly this type of bobbins. If you're not sure whether your machine accepts L size bobbins, just measure your original bobbin. If it's diameter is 0.8 inches (20 millimeters) and the height is 0.3 inches (7.5 millimeters), then your machine takes L size bobbins and you may safely buy this kit. Also, here's a list of embroidery machines sorted by the type of bobbins they use.